Just yesterday, sources revealed that Samsung is currently in the process of testing behind-the-display selfie cameras. Less than 24 hours later, the company has confirmed this and also revealed what other display technologies it’s working on. 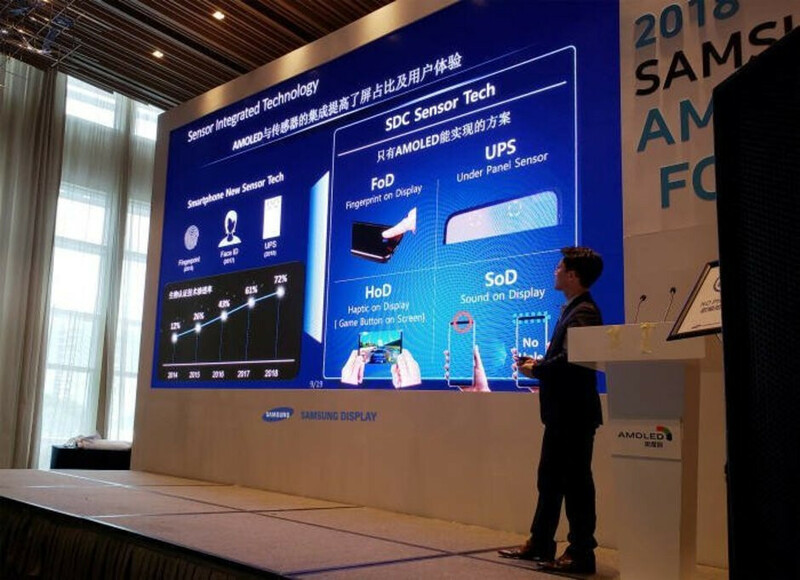 At the Samsung OLED Forum conference, which was held at the Shenzhen Marriott Hotel in China and attended by around 20 customers, the South Korean giant took to the stage to reveal the four new features that will be key to its future smartphone designs. Unsurprisingly, one of the technologies mentioned was in-display fingerprint scanners. This is currently expected to make it onto the Galaxy S10 series but was most recently seen on the Huawei Mate 20 Pro and Mate 20 RS Porsche Design. From the looks of things, this will be paired with haptic feedback across the whole display, thus creating what is essentially a competitor to Apple’s 3D Touch. In addition to this, Samsung is looking into solutions that will allow it to hide the in-ear speaker. While the details of Samsung’s implementation still remain unclear, the most logical solution would be a piezoelectric speaker that vibrates the smartphone’s frame in order to produce sound, as previously seen on Xiaomi's Mi Mix phones. Lastly, as mentioned above, behind-the-screen selfie cameras are in the works. 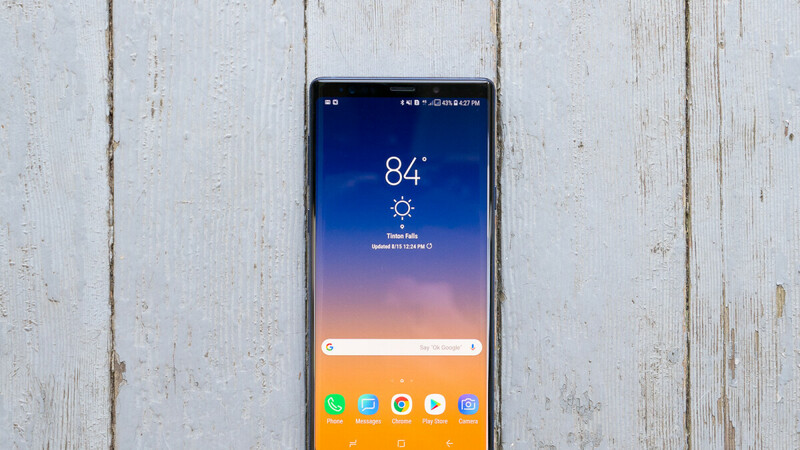 Although not all of this technology is guaranteed to arrive in next year’s Galaxy S10 or even the Galaxy Note 10, it’s certainly a step in the right direction and suggests bezel-less smartphones from Samsung could arrive sooner than originally thought. Exactly. The notch is a lazy approach that just gives the illusion of extra real estate, thus cheating consumers. I would rather see innovation go into tech behind the display. Samsung is no pioneers what so ever. They are a reaction oriented company. Great hardware but not a pioneer. Your delusional. The notch is revolutionary more than any thing Samsung did(they copped apple) it was something never done before. I would rather have it than a bezel on top. But having a camera below a screen is the next step. I said so years ago. That is something that almost every company is working on. This article is to raid awareness and raise stock prices. "The notch is revolutionary more than any thing Samsung did(they copped apple) it was something never done before." Not only you're an iWinner, you're also so iSmart. You actually deserve to use an iPhone mate but FYI, Essential shipped a phone with a notch before the iPhone X arrived. You knew that but I guess you just wanted to be an iTroll. I still think you should use an iPhone though. It's a great phone. "iPhone X was being developed well before Essential PH-1 made it's first appearance" - Evan Blass You're also one of them who say Apple wasn't the first to remove headphone Jack. Moto Z came out in June 2016 without 3.5mm jack but iPhone 7 with no jack leaked in November 2015. https://www.forbes.com/sites/gordonkelly/2015/11/28/apple-to-abandon-headphone-jack-in-iphone-7/ These OEMs copy Apple's leaks and implement them in their phones. "You're also one of them who say Apple wasn't the first to remove headphone Jack. Moto Z came out in June 2016 without 3.5mm jack but iPhone 7 with no jack leaked in November 2015. https://www.gsmarena.com/oppo_r5-6753.php Oppo R5 came out in December 2014 with no headphone jack. Well I hope you remember Oppo R5 had a design issue. HTC G1 came out in 2008 with no jack, your point? Same point you had pointing out Apple had plans to ditch the iphone before the Moto Z came out ;) And if it had a design issue who cares? It still removed the audio jack for the USB Type C before Apple. And if you saying this: "HTC G1 came out in 2008 with no jack, your point?" Then same to this I guess ""iPhone X was being developed well before Essential PH-1 made it's first appearance" - Evan Blass"
So you are saying you don't know the difference between "can't fit a jack cause phone too thin" and "intentionally removing headphone jack"
That's funny because for years Samsung phones were thinner than iPhones and still had a Jack. In fact lots of phones are thinner than iPhones and still have jacks. You are a not so smart fan. Many are smaller and thinner and have bigger batteries too. The S7 edge is s aller than the iPhone S Max and yet has a 30% larger battery. Lol Note 9 has larger battery than XS Max doesn't last longer tho. Sit down. Actually it does. By nearly an hour. Oh and yeah, I do expect that a computer that does more uses more power. Any simpleton knows that. My Note 9 last me 2 full work days on a single charge. No iPhone on the planet can match that. You must not use your Note 9 much. Half the things - bold claim. I'm sure you're talking about changing icon size, moving icons from one row to another, changing page transition effects and yeah the most innovative clicking selfies with stylus. A iPhone 5s lasts 4 days with a single charge (...if you keep the data closed and only use it for phone calls). Nothing is changing when you just doubt things. I used the 5S as a work phone for 1 year. It's very hard to make it last 4 days while using it(even if it's just for phone calls), quite the challenge. Yes, it is hard, but it is possible: close the data (all of it), dim the display, use it for (short) phone calls - stay away from texting - and you will get 4 days. I'm sure kid. https://youtu.be/TmQJ0SEccOI Don't post PhoneBuff videos, y'all didn't consider it when iPhone X beat Note 8/9 in speedtest. Nope you are wrong and he is right. https://www.youtube.com/watch?v=RF6-eLoNwZQ Note has 37 percent left while Iphone XS Max dies conmpletely. Audio and brightness on both devices are set equally. Audio and brightness but not the resolution ;). Note 9 set to qhd has a worse battery life than XS. You do realise he dropped the resolution down to 1080p which closer to the Iphone XS max's resolution which which is 1242p 1480p is alot higher. And im sure phonearena and others have said dropping resolution from 1440p to 1080p has no effect on battery life. He could have drooped it to HD and get even better times, that's not the point. The point is Note 9 - used at its best - delivers less battery times than XS; at least this is what almost every test has shown. Either way, they both have great battery lives and users will be happy with both of them, but a fact is a fact. Not really. I've noticed no appreciable difference in battery life with either resolution. I keep it at qhd because it made no real difference.